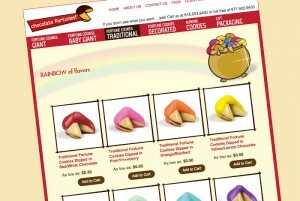 Chocolate Fortunes is the largest distributor of hand-dipped personalized and decorated chocolate covered fortune and almond cookies since 1987. Chocolate Fortunes specializes in hand-made hand-dipped chocolate covered traditional and Giant “football-sized” fortune cookies dipped and driped in a veriety of colored chocolate, wraped in a bow with a personalized message inside. Toppings include: dark chocolate, milk chocolate, white chocolate, butterscotch chocolate, peanut butter chocolate, dark mint chocolate, and their famous Rainbow of Flavors. Rainbow of Flavors include choice of pink chocolate, yellow chocolate, orange chocolate, red chocolate, blue chocolate, violet chocolate and green chocolate. “Hi, I received my chocolate covered fortune cookies and OH MY they are delicious! I’m afraid I might eat all of them before my event. Lol” “Chocolate makes me Happy! And YES it makes life worth living!” have a nice day!